Boulder Falls has been providing commercial landscaping in Vancouver WA for over 16 years. In that time we have built our reputation as having so much more to offer than your general landscape provider. Our services include year-round care, including winterizing, deicing, and snow removal in the winter months. We also offer complete landscape construction, from retaining walls to pathways, water features to ponds and much more. At Boulder Falls our customer satisfaction is important to us. We strive to get every detail picture-perfect. As a result, our customers have been singing our praises, giving us a large number of repeat customers and word-of-mouth referrals. Here are some of the credentials our commercial landscaping professionals hold, guaranteeing that you will receive excellent service every time. Our years of commercial landscaping in Vancouver WA have made us experts on the unique needs of lawn care in the Northwest. The value of having a locally owned landscaping business working for you is that you profit from our knowledge of the region. Whether you have native plants or a more diverse selection, Boulder Falls has the years of expertise to know how to treat them in our local climate. We know the precise height at which grass should be cut in the summer as compared to cooler months to maximize its health and longevity. We know how to handle snow removal and which deicers to use in order to refrain from damaging your grass or other plants in your yard. When it comes to commercial landscape maintenance in Vancouver WA, Boulder Falls has earned a reputation for excellence. 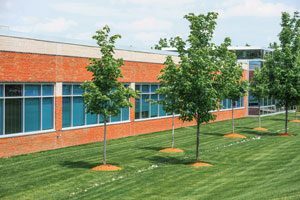 Call Boulder Falls today for a free, no-pressure estimate on commercial landscaping.